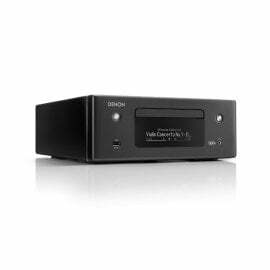 The Denon CEOLN10 RCDN10, with the sound possibilities they are nearly endless. You can listen to your favourite music, stream your online playlists via Spotify or another music streaming service. With the in-built HEOS technology, using Bluetooth via your network. Enjoy internet radio and AirPlay2 and the most convenient thing; control this mini hifi system with the Amazon Alexa. You can connect this device up to your google device or amazon Alexa for voice compatibility, improve your listening environment and connect your devices to control your volume, play, and pause or skip tracks you don’t want to listen to. With Further enhancements to improve your overall experience. With the RCD-N10 on top, they give a response by light. The Network Receiver has resistance using scratch resistant surface which is reactive to a distinct touch via the touch keys. Via Wi-Fi with HEOS, AirPlay2 or via Bluetooth® connect to your favourite music sources. Denon CEOL RCD-N10 delivers quality sound, no matter the method you listen. Enjoy the sound from the HiFi system with your TV, with the Denon CEOL RCD-N10, thanks to the optical inputs and learning function from the TV. You can improve your audio for a night at the movies, or a gaming experience.